Nancy and her friends George and Bess fly down to Washington, D.C., to watch some of the world's best tennis players shoot for a championship. But the action is hotter off the court when Nancy gets tangled in a bizarre case of mistaken identity. Nancy bears a striking resemblance to Teresa Montenegro, the rising young star from San Carlos. Then Teresa's boyfriend is kidnapped, and Teresa may be next! In a last, desperate move to outwit the hired guns, Nancy and Teresa trade places. 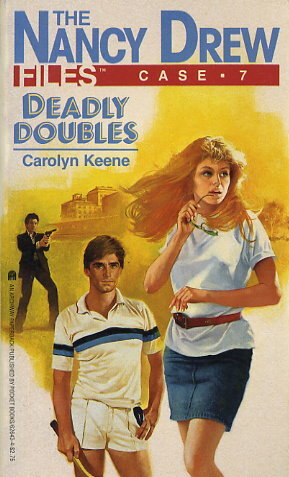 Nancy strides onto center court to play a deadly game of doubles--while a ruthless killer stalks her from the stands.